Baby vision development is important as the eyesight is the least developed sense with which the baby is born. According to research, the infant sees approx. 30 times less sharply than the adult. Therefore, it is important to stimulate the infant’s vision from the first months of his/her life. Black and white baby toys are best suited for this purpose. How does the baby see the world? The image seen by the infant has no depth, it is two-dimensional. The child focuses on the edges of the objects he/she sees and then turns his/her eyes toward the centre, looking for a distinctive element. His/her attention is most easily drawn to images with contrasting colours, such as simple black-and-white patterns, with relatively large and sharp lines. 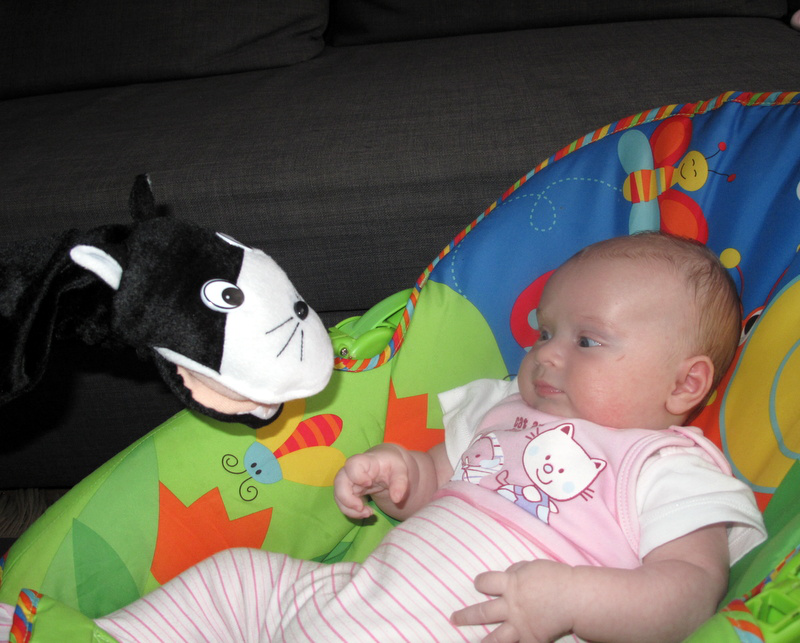 Because of the way the child sees the world, the best tools for stimulating the baby’s vision are black and white toys, such as the Kitty mouth puppet from Moowi. It enables parents to exercise the eye-following skill. The parent should show the puppet to the child and talk through it to him/her. When the baby focuses on the puppet, you can move it in different directions. The infant should follow it with his/her eyes, as shown in this film. Why is it important to stimulate infant eyesight? Making these simple stimulating exercises has a beneficial effect on the maturation of the child’s eyes – this is a dynamic process, determined both genetically and by the supply of appropriate visual stimuli. Performing stimulating exercises can also help develop a child’s imagination and concentration. Have fun with our Kitty black and white baby toy while doing baby vision development exercises :). Here you will find information about the most important events in the life of our company. We also present inspirations about how to use our products in the speech and language therapy.